The trick comes in making sure that the space is large enough to ensure that their goods will fit, but not too big that they are paying for additional space that they may not need. At this point, many will turn to their local self-storage companies website to help estimate how much space they currently have. Larger companies even have an online space estimator to assist you. Typically, the good space estimators will allow you to break your household furniture down into “zones”. These zones are generally representative of the size of the house that they are in. Common zones would be bedrooms, dining, kitchen, family, outdoor etc. and will allow the customer to easily and quickly select from a suggested furniture list. Other estimators even allow the customer to select how many of a particular item they have i.e. 6 x chairs and 1 x dining table. It’s All About the Cubic Metres! Once the customer has used a space estimator they should have a clear idea about how many cubic metres of furniture or storage they require. For example, a 2 bedroom unit normally consists of furniture and belongings calculated at around 23- 25 cubic metres in volume and as such typically fits into a 3m x 3m storage unit. However, there can be other factors that determine the right size for you. Pro tip – the more you can pack in boxes and “standardise the shape”, the easier and more efficient the packing will be. Most self-storage companies sell quality packing boxes for this purpose. One factor that significantly affects the storage solution you need is if there are any special items to be stored. Special items can include things such as pianos, antique furniture, artwork or a book collection. These things require special consideration when it comes to packing in a storage unit and need to be highlighted to the staff to find the best storage solution. Storage Problem: You are moving and storing your 2 bedroom apartment for 2 weeks while your new apartment is finished. 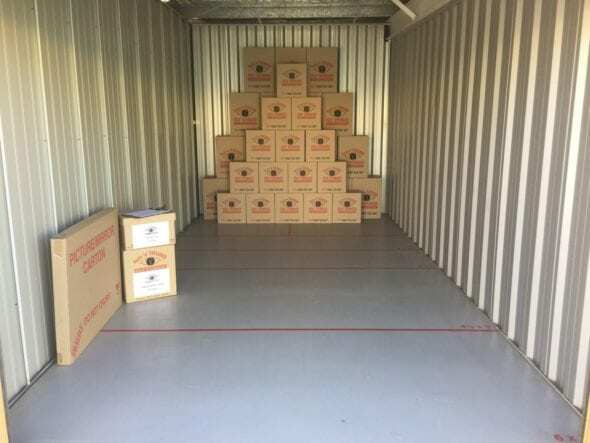 Storage Solution: You are recommended a 3m x 3m storage unit but decide to take a 3m x 4m space as the difference in the monthly rate is LESS than the amount of the additional removal fees to spend time packing it just right into the smaller 3m x 3m space. Pro tip – Time dictates that it is cheaper to pay for a larger unit because it’s quicker to pack! Storage Problem: You are moving and storing your 2 bedroom apartment for 12 months while you travel overseas. Storage Solution: You are recommended a 3m x 3m storage unit but decide to give some items to family members so that you can have the removalist squeeze the storage items into a smaller self-storage unit as the long terms savings per month outweigh the additional removalist fees to make them fit. Pro tip – Time dictates that its cheaper to maximise a smaller unit as the savings add up over the 12 months! The final hurdle that people encounter when selecting a storage unit size is the impression that the space offered is not big enough. Many people have difficulty in picturing their furniture and belongings packed in 3-dimensional space. Why? Because they are so used to seeing these same items spread out throughout their house. The trick to determining your storage size is to make the most of the height of the storage space. Quality storage companies will have units that are a standard 3m tall. This height means that things such as your 3 seater lounge can be stood on their end to maximise the height while taking up the minimum amount of floor space. It also means that your boxes can generally be packed right to the ceiling maximising that space as well. and then use our “Get a quote” option to send that to our experts who will then discuss with you the best solution for your needs. Safe ‘n’ SOUND Self Storage has been providing state of the art, award winning self-storage solutions for over 20 years. Contact us today to find out how we can customise a storage solution for you.